COVERGIRL kind of reinvented liquid eyeliner when they invented Perfect Slice. This eyeliner is on a little wheel that rolls along the eye and it rolls the eyeliner along the eye area, giving you precise liner and winged perfection in just seconds. Using it looks hard because of the angle of the eye but its actually very easy. You just apply it to the eye and it goes on. Roll liner backward and forward in a fluid motion to apply liner. Soft wheel tip rotates easily back and forth. The end look is precise graphic lines. In the end you get a smudge-proof, quick-dry formula. Doesn't skin or tug upon application. It doesn't make liner appear too heavy or marked. It just appears light and of a sharp line even though it is an intense black color. But the line doesn't end up becoming too intense for the look. I like how it looks nice and it doesn't look trashy or too heavy/intense. For this look it made it look nice and added just a hint of black. COVERGIRL IS NOW CRUELTY-FREE. 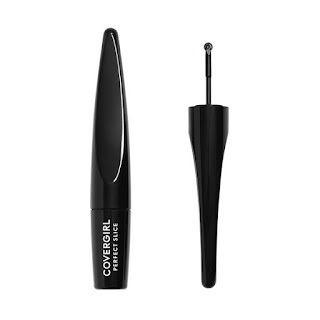 COVERGIRL Perfect Slice Liquid Precise Eyeliner retails for $13.49. It is available at mass market retailers such as Walgreens, CVS, Rite-Aid, Walmart, Target and Ulta. Also available on www.ulta.com. Like COVERGIRL on Facebook: https://www.facebook.com/covergirl; Follow COVERGIRL on Twitter: @covergirl; Follow COVERGIRL on Pinterest: https://www.pinterest.com/covergirlxo/; Subscribe to COVERGIRL on YouTube: https://www.youtube.com/user/CoverGirl; Follow COVERGIRL on Instagram: https://instagram.com/covergirl/; Follow COVERGIRL on Tumblr: http://covergirl.tumblr.com/; Follow COVERGIRL on Vine: https://vine.co/u/907771872836456448, Follow @COVERGIRLXO on Snapchat and Follow COVERGIRL on Google+: https://plus.google.com/+covergirl/videos.